The challenges our teachers face have never been greater. In classrooms across the country, students start each year with a huge range of prior knowledge, literacy skills, and language proficiency. Teachers have little time to plan and prepare to meet the students where they are, let alone compete with students’ media saturated lives outside of school. The new Common Core standards, adopted by 41 states, requires students to not only master skills and procedures, but also demonstrate conceptual understanding and higher order thinking. The flow of ed-tech products into the marketplace has done little to improve outcomes, and traditional textbook publishers have struggled to adjust to new standards, or meet the needs and interests of today’s students. In Levered’s home state of California, the challenge to meet the needs of every student is easy to spot. In 2018, 43% of California’s 4th graders met standards in mathematics. In 5th grade, the percentage dropped well below 40%. At the national level, U.S. math scores continue to lag far behind on international tests, and significant achievement gaps persist for students in underserved communities. English Learners make up about 10% of the nation’s public school population. English Learners are 3x less likely to be identified as gifted and talented. Only 1.4% of graduating English Learners will take college entrance exams. Levered’s Common Core aligned 4th grade math program—designed specifically to address these issues—has been in California classrooms since 2016, and it made an immediate impact. 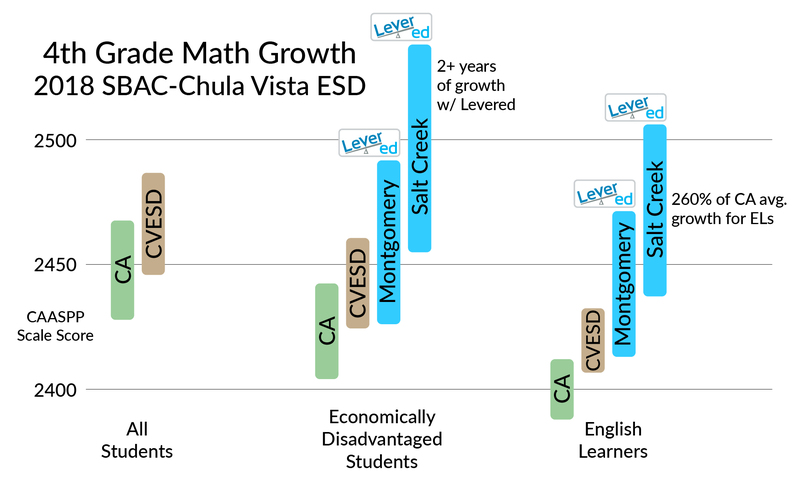 Salt Creek Elementary in Chula Vista has been using Levered’s 4th grade fractions and decimals curriculum for two years, and in both years had the highest 4th grade CAASPP math scores in CVESD, the largest K-6 district in the state. In the same district, Montgomery Elementary’s 4th grade math growth rose to 160% of the state and district average in their first year of piloting. English learners in CVESD pilot schools showed 4th grade math growth at 260% of the state average after piloting Levered. Salt Creek’s English Learners ended 4th grade with average math scores well above the state average for native English speakers. Salt Creek’s economically disadvantaged students made over two full years of growth in math in a single year, scoring well above the state average for students who are not economically disadvantaged. Growth for Latino students was 170% of the state average for all students, ending 4th grade with scores above the state average for Caucasian/white students. Levered’s comprehensive approach—facilitating best instructional practices and student-centered learning—has made it possible for students at every achievement level to dramatically accelerate their learning in less than a year. Students in historically underperforming subgroups were able to flourish, closing the achievement gap in math before their teachers’ eyes. When implemented for a second year in the same school, students made even bigger gains. By making it easier for teachers and students to realize the Common Core’s goals for conceptual development, critical thinking, and collaboration, Levered has shown that teaching and learning mathematics with rigor can be fun, meaningful, and extremely effective. In post-pilot studies, 100% of piloting teachers wanted to use Levered the following year and would recommend Levered to their colleagues. Even more rewarding, both the teachers and students report excitement for learning math in the classroom. Levered’s 4th grade instructional system is now available for all schools. Sign up here to get a demo and find out how Levered can make an impact for the students and teachers in your community this school year.